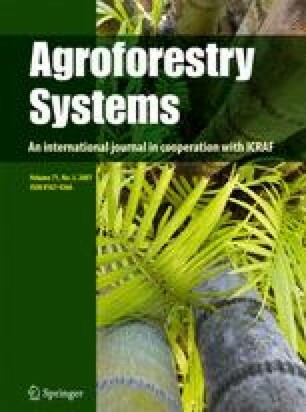 The potential of allye cropping systems to sustain a high productivity with low external inputs and the reduction of maize/weed competition through weed suppression in different alley cropping and sole-cropped mulched systems was studied in Costa Rica at CATIE. Data were recorded eight years after establishment of the experiment. Plant residues ofErythrina poeppigiana trees (10 t/ha dry matter) planted at 6 by 3 m reduced weed biomass by 52%, whileGliricidia sepium trees (12 t/ha dry matter) planted at 6 by 0.5 m reduced weed biomass by 28%, in comparison to controls.Erythrina had a considerable impact on grass weeds, whileGliricidia reduced the incidence of some dicot weeds. Weed competition significantly reduced maize yield in all systems. Nevertheless weed suppression contributed to the higher maize grain yield underErythrina andGliricidia alley cropping of 3.8 t per hectare as opposed to the unmulched control yield of 2.0 t per hectare.